Arayot – July 20th Updates! Thank you for tuning back into the Arayot blog, also known as the most exciting corner of the internet this summer. The past few days have really been a blur because they’ve been so packed with activities. Monday we continued practicing for Zimriyah and squeezed in some time for art and sports in the afternoon. Monday night we had a campfire, ate s’mores and sang songs. It was a really special opportunity to spend time together as an aydah, away from all of the energy and stress of Zim prep. On Tuesday we had one of our last “normal” mornings of first session. It’s hard to believe how fast the time goes at camp! In the afternoon we watched the Kerem performance of the musical “Damn Yankees!”. They did a great job and it was a lot of fun to be in the audience. After the show, we had a quick snack (nishnush) and then had another Zim practice. After practicing Zim, we got a bunch of wacky instructions to run back to the bunk and put on a bathing suit and all sorts of other random articles of clothing. We had a little time to go back for our mystery trip in the bunk and then we came down to dinner ready to go. We each had three left socks and a packet of jelly, as well as bug repellant and towels. Dinner that night was orange chicken (SO GOOD) and we were all buzzing with anticipation and excitement. Then we all boarded the bus to set off for our mystery location. 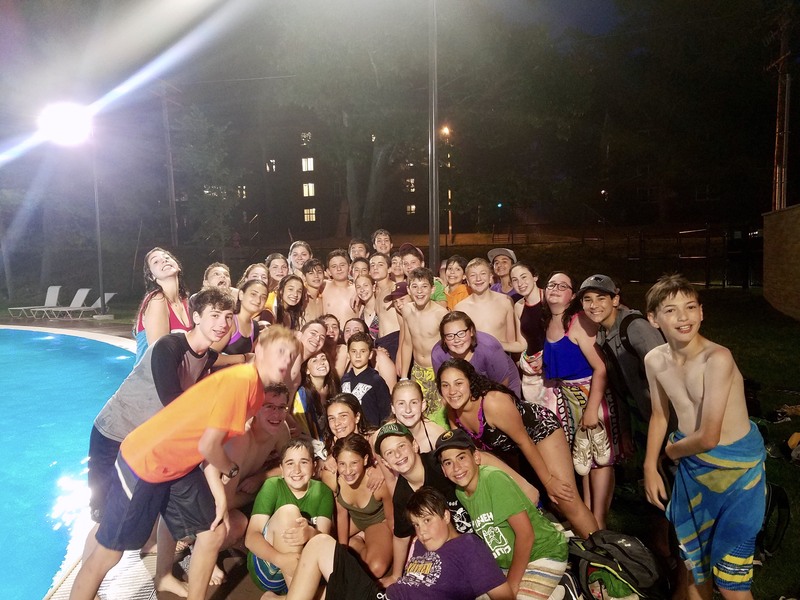 The surprise turned out to be an evening swimming and playing at the UNH pool in honor of dear Natan Fagelson’s Bar Mitzvah. It was an awesome evening and we had so so so much fun. Serious mazel tov to Bagel, and thanks for a great night. Wednesday was an in-camp Achla Yom. We took a relaxing walk around the Agam and had free swim. In the evening we got to practice our Zim songs with the band and had some free time to just hang outside with together. We are all super excited for Zim tomorrow! It’s gonna be awesome! Check back in Monday for details on a whole new session!